Looking for a new way to say "I love you" on Valentine's Day? Try zombie vomit! 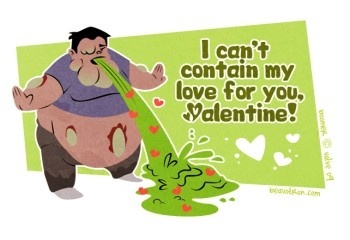 Freelance illustrator Alexandria Neonakis has created a series of Left 4 Dead themed Valentine's Day cards featuring Bill, Francis, Louis and Zoey along with Boomers, Hunters, Witches and more in a variety of cuddly, romantic and heart-warming poses. And while it might seem a bit incongruous, Valentine's Day appears to be Neonakis' holiday of choice: Last year she created a series of Valentine's cards based on Team Fortress 2 and has a few others based on World of Warcraft and Katamari Damacy. Neonakis' interest in videogames comes honestly. Since January 2008 she has been employed with HB Studios, a videogame developer based out of Halifax, Nova Scotia, where she worked on NBA Live 09 All Play for the Wii. Her Left 4 Dead Valentine's Day cards, and all the rest of them, can be seen at her blog, Nuts N' Beavers.